In this Keynote Lecture, renowned philosopher A. C. Grayling will set out the case for a written constitution, to address the centuries-old anomaly that the UK has no formally agreed written Constitution, despite forming the model for constitutions around the world. Professor Grayling will examine the constitutional questions raised by Brexit, and argue that now more than ever, it is time for the UK to debate and confirm a written constitutional Agreement of the People for the twenty-first century. A.C. Grayling is Professor of Philosophy and Master of the New College of the Humanities, London, and the author of over thirty books of philosophy, biography, history of ideas, and essays. He is a columnist for Prospect magazine, and was for a number of years a columnist on the Guardian and Times. Following the success of the Putney Debates 2017, the Oxford Foundation for Law, Justice and Society is pleased to announce the publication of the collected volume of essays to emerge from the Debates. Featuring contributions from commentators including A.C. Grayling, Vernon Bogdanor, David Runciman and Timothy Garton Ash, the volume brings together 25 prominent intellectuals to grapple with the Brexit conundrum and debate the constitutional crisis at the heart of today’s politics. 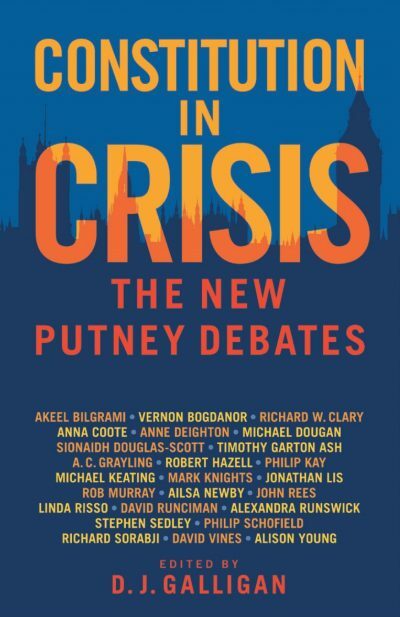 Constitution in Crisis: The New Putney Debates is available to buy in bookshops and at St Mary’s Church, Putney, as well as online at the specially discounted price of £9 (see here). This entry was posted on October 27, 2017 by Constitutional Law Group in Events and tagged written constitution.